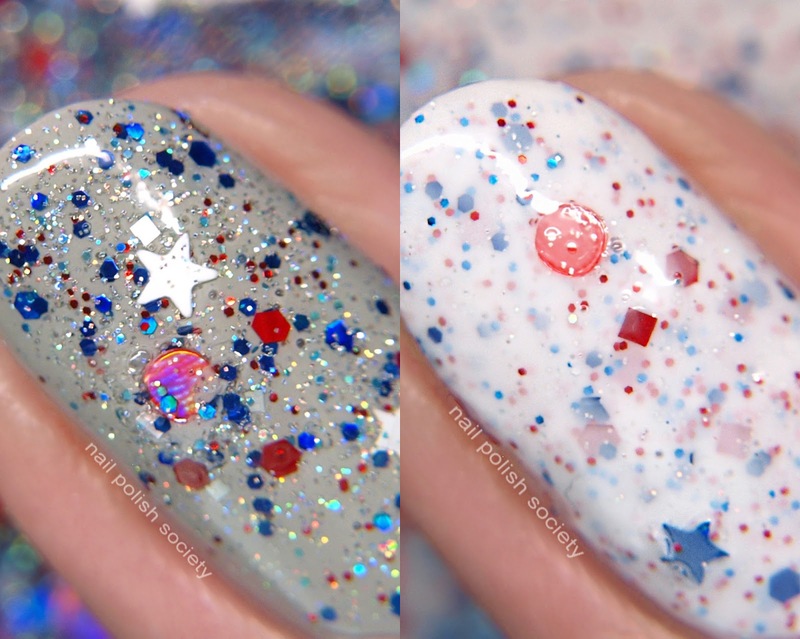 Honor is a white crelly with red, white, and blue glitters in various sizes and shapes, and holo micro glitter. This was pretty easy to apply but did require some digging to get the larger glitters out. Shown is three thin coats plus top coat. Freedom is a glitter topper packed with red, white and blue glitters and holo micro glitter. This one has a high glitter payout straight out of the bottle but did also require some digging for the larger glitters. Shown is one coat over Zoya Dove. The Patriotic Duo will be available Friday June 8th at 9 am EST. They will retail for $10.50 each or $18 for the trio. Make sure to use my code NPSOCIETY for 10% off your order!